I have so far not included any of the Beatles tracks here because I believed that they can never be considered as long forgotten. However for sense of completeness here is one of the top tracks from the Beatles. "A Hard Day's Night" by the English rock band the Beatles was first released in 1964. 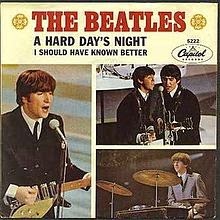 In 1965, "A Hard Day's Night" won The Beatles the Grammy Award for Best Performance by a Vocal Group. In 2004, this song was ranked number 154 on Rolling Stone's list of "The 500 Greatest Songs of All Time.